Ankara stated that the Turkish military operation in Afrin won't be affected by the 30-day nationwide truce in Syria. 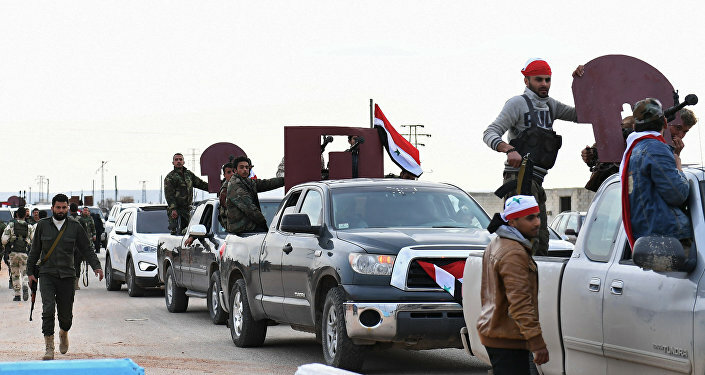 The "Kurds Falcons" brigade, formed by “Hamzi Division” members from the Syrian Free Army, will join the "Olive Branch" operation in Syrian Afrin on Monday, Anadolu reported. According to the news agency, the brigade will include 400 Kurds and 200 Arabs who have completed special forces training. They will take part in the siege of the city of Afrin and will assist the Turkish armed forces. According to the commander of the group Hasan Abdullah Culli, it consists of Kurds, inhabiting the Syrian region of Aazaz, and its purpose is to "release the Afrin population from the terrorists of the Workers' Party of Kurdistan (PKK)." Since January 20, the General Staff of the Armed Forces of Turkey has been conducting the operation "Olive Branch" against the formation of Kurds in Syrian Afrin. Damascus strongly condemned Turkey's actions in Afrin, noting that this territory is an integral part of Syria. Moscow in connection with the situation in Afrin called on all parties to restrain and respect the territorial integrity of the country. On Saturday, the UN Security Council adopted on Saturday the resolution stipulating a 30-day ceasefire in Syria. However, Turkish Deputy Prime Minister Bekir Bozdag said that the truce won't affect the Turkish operation against terrorists.